Keep all nursery essentials neatly organized and easily accessible with this Hinwo Cotton Rope Storage Basket. Made of cotton rope and equipped a detachable linen lining, the basket provides a neatly tailored and elegant appearance. It is perfect for a bedroom, kid’s room, nursery, craft room, or kid’s play area. The cotton rope basket measures approximately 14.2 by 13.2 by 11.4 inches (Upper Dia. x H x Bottom Dia. ), offering 20 liters ample and reliable storage space for storing a variety of items. Stash anything from kids’ clothes, stuffed animals, and toys to bath linen or nursery supplies doesn’t have to be a chore. The storage basket provides a collapsible design. Simply fold the basket down flat to 3 inches in height for space-saving storage when not in use or when needing to transport. 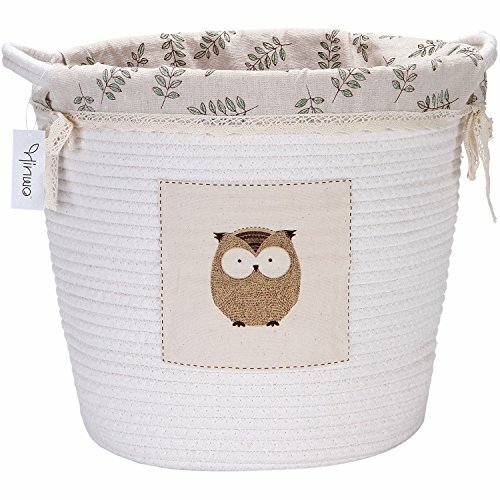 The cotton rope basket features off white base and owl pattern to offer natural, clean, stylish aesthetics for seamless coordinating with surrounding décor.